Bitter gourd (also known as bitter melon, bitter gourd, bitter squash, or balsam-pear) is popular in Chinese cooking, as well as in many South East Asian countries. 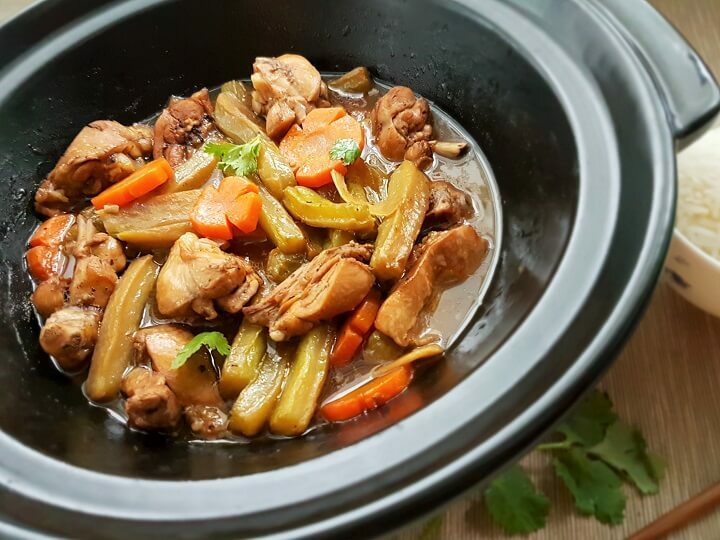 Sometimes, I’ll have a craving for this braised chicken with bitter gourd dish as it is so delicious especially when eaten with a bowl of steaming hot rice. For many, the bitter flavor takes some getting used to. If you have not tried bitter gourd before, this braised chicken with bitter gourd will gently ease you into the world of bitter gourd. The light braising process and savory sauce mellows the bitter flavor and it makes for a very appetizing dish. A great comfort food to me. Claypots are excellent for braising, soups and stews like this. 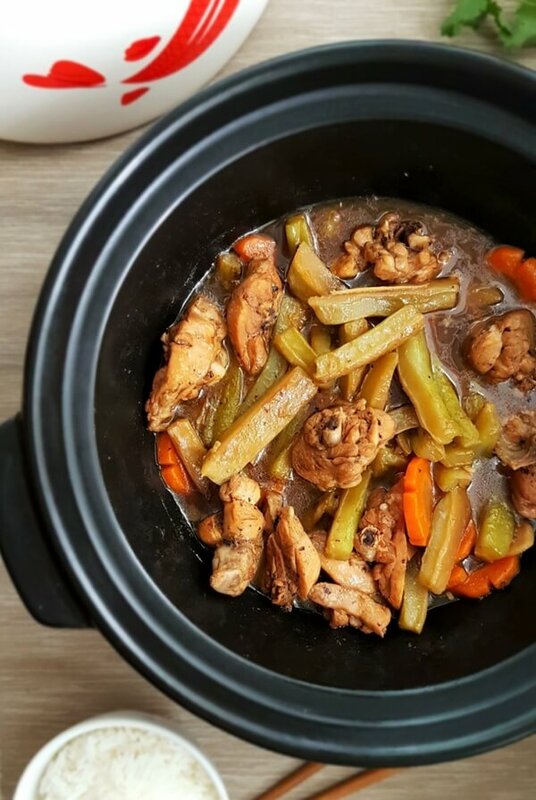 Food cooked in a claypot is very tender, flavorful and fragrant as it retains heat well and seals moisture in the food. You can cook and serve directly from it. 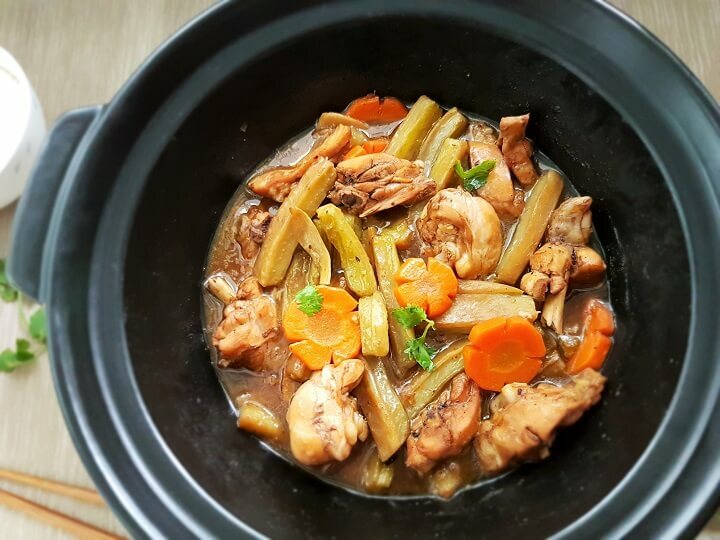 I used Tanyu claypot for this recipe, but you can use any other claypots too. 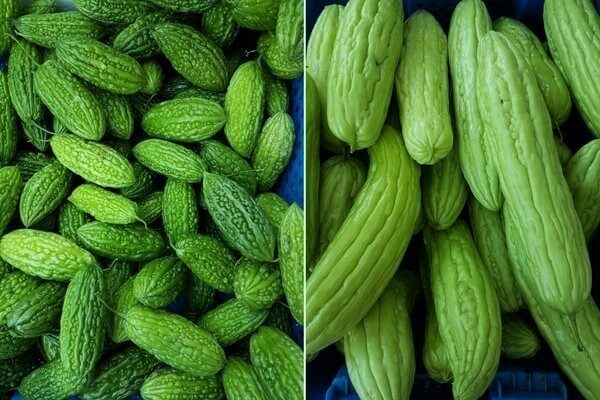 Traditional Chinese medicine considers bitter gourd as a cooling ingredient, capable of clearing body heat, reduces the symptoms of diabetes, purifies blood, improves stamina and energy, prevents constipation, helps with weight loss and also keeps skin free of blemishes and provides a glowing complexion. Bitter melon contains charantin, an active substance with anti-diabetic properties which helps to reduce blood sugar levels. Bitter gourd is also rich in vitamins A, B3, B5, B6, C and contains minerals like calcium, copper, iron, magnesium, manganese and zinc. It has twice the beta carotene of broccoli, twice the calcium of spinach and twice the potassium of bananas! Love it or loathe it, bitter gourd is really good and beneficial for our health. There are two types of bitter melon – Chinese bitter melon and Indian bitter melon. Both type of gourds have white seeds, thick warty skins and are bitter in taste. The skin turns yellow and the seeds become red when ripe. The biggest difference lies with their appearance. Chinese bitter melon is broader and longer (growing up to 20 – 30 cm long), oblong with blunt ends and they’re pale green in color. The Indian variety (commonly referred to as karela) is narrower, smaller with pointy ends a and a highly jagged surface. When buying bitter gourd, avoid those that’re turning yellow as it is an indication that they’re already ripe and therefore be too soft. The skin should also be free of blemishes and feel firm to the touch. A lady that I met in the market told me to observe the space between the ridges on the Chinese bitter melon. Apparently, the wider they are, the less bitter they will be. Bitter melon can be braised (as described in this braised bitter gourd with chicken recipe), stir-fried, scrambled with eggs, added to curries, boiled, etc. To reduce the bitterness of the bitter melon, rub the sliced bitter melon liberally with some salt. Let it sit for about 10 minutes before rinsing off the excess salt. Don’t want to miss a recipe? Sign up for Souper Diaries newsletter delivered to your inbox! Tender chicken thighs with bitter gourd braised with light soy sauce, oyster sauce and fermented black beans cooked in a claypot. To reduce the bitterness, rub bitter gourd slices with salt. Let sit for 10 - 15 minutes then rinse. If you don't mind the bitter taste, you may skip this step. Heat up oil in a wok or claypot. Stir-fry bitter gourd and carrots for about 3 minutes. Remove and set aside. Add ½ tbsp of oil if required. Stir-fry garlic, ginger and fermented black beans till fragrant. Add chicken and fry till the surface is no longer pink. Return the bitter gourd and carrot slices to the claypot. Pour in seasonings and mix everything well. Add water. It may seem a little but the gravy will be just nice when the stew is done. Cover and bring to a boil. Then reduce heat and simmer for about 15 to 20 minutes until the chicken is tender. Have a quick taste. Adjust seasonings or liquid if necessary. Add salt to taste. Once you're satisfied with the taste, pour in the corn starch slurry to thicken. Finish off with a splash of shaoxing wine. The chicken in this recipe can be replaced with pork ribs if preferred. I am going to have to make this! looks awesome! I am half Okinawan and grew up eating bittermelon in a lot of food that my grandmother made. My favorites are pickled bittermelon and also bittermelon with pork, eggs, and tofu. I have never really eaten it much in a dish like this. Most of the time it was just stir fried with some kind of protein, mostly pork! Awesome recipe! Thank you! Nice! Not many people like bitter melon so I’m glad to hear that you ate it growing up. I’ve not tried pickled bitter melon before. It sounds interesting! What do you pickle it with? A great article Yvonne on a dish which looks very tasty. 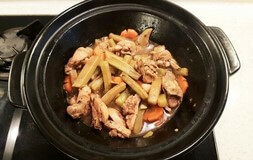 I am a big fan of chicken dishes but mainly those with a sweetened flavor ( with pineapples or apricots ) and this one in particular looks very healthy and appetising judging from the great photos you have in the article. I have never seen these bitter melons before in our local markets in Perth but I am sure some of the Asian fruit and vegetable shops in our supermarkets would stock them. This new recipe of yours looks super delicious. However, I have to admit that I have never heard of bitter gourd before (or bitter melon, for that matter). It’s strange because we love to cook in my household and I have heard of most ingredients before, but not this. And it has so many wonderful health benefits as well. Just one thing – what does bitter gourd actually taste like? Sorry for the late reply! Bitter gourd taste just like its name imply – bitter. If you have not tried it before, it’ll take some getting used to. There are ways to slightly reduce the bitterness which I described in the post. Thanks for dropping by and do have a go with this recipe! Wow, I love your photos! Beautiful site 🙂 I have never heard of bitter melon before, and your recipe looks delicious! 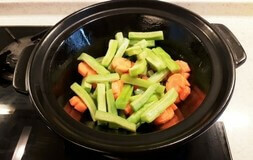 I love soups and stews, they are my favorite thing to eat during the cold winter months. I also love Asian food. I would love to incorporate more summer soups into my life. Do you have any summer soup recipes? What spices are most predominant in Asian food? I love chicken and all kinds of recipes involving chicken. So I like your recipe with bitter melon, fermented black beans, and wine. It looks as you say simple and delicious. I’m not sure if we have bitter melon in Norway but it’s getting better for us. I can see that we are getting more and more other types of vegetables than we have gotten before. I live that to taste different tastes than we are used to. I hope you’ll be able to find bitter melon. They’re usually available in Asian markets. The braised chicken and bitter gourd looks yummy! I haven’t done any cooking with bitter gourd but this recipe looks like a good introduction for me. I especially like all the nutrition content in bitter gourd- it’s like a super vegetable! Thanks for sharing the tip about rubbing salt on it to make the bitter gourd less bitter. Nice to see you again! I love the nutrition content in bitter gourd too. I think this vegetable is really underrated and more should be done to promote it.